We have a half dozen beautiful butternut (Juglans cinerea) trees here in the yard and woodland edges. They provide shade from the afternoon sun, while we have a picnic dinner or play croquet during family gatherings. The trunks, as is typical, are forked and crooked. The crowns are broad and spreading; the ashy gray bark is deeply furrowed. The trees all seem healthy, although I did notice some black coloration at the base of one. I am not sure if this is butternut canker. I hope not. The canker was introduced into the U.S. around 1960, probably coming in on shipments from Asia through the St. Lawrence seaway. Apparently over 90% of butternuts across the tree's range are infected; the trees that become infected die within 15 years. So far, ours look healthy. During the last few weeks I have watched the buds emerge and expand, the catkins (hosting the stamens) elongating further with each passing hot day. The two photos below are from the same branch; one taken on April 18th, the other, 9 days later, on April 27th. The red and gray squirrels love these butternuts. Even in spring they carry off partly chewed nuts that lie beneath the tree. The large fruits form in the fall -- the hard, ribbed nut (above) is contained within a yellow-green, sticky husk. Once they fall to the ground the husks turns dark black. Ambitious folks gather the sticky mess (they stain your hands) and extract the sweet, buttery-flavored nut. I recall that we had some stashed in our attic many years ago. I don't remember if we put them there for later harvest or if squirrels brought them in (since our house has always been squirrel porous). We look out the back door to the two biggest butternuts. I hope these "white walnuts" live many more years. Bella and I took the long road back to Winterberry Farm, through southwest New Hampshire and down into the Pioneer Valley. Most of the trees along the way were still grayish, not yet in full spring color. Scattered amongst the grays, to brighten the way, was a snowy white understory tree - the shadbush (Amelanchier arborea). The shadbush is so named because it flowers when shad are swimming upstream to spawn. Another name for the same small tree, is juneberry. Its small, round red or purple berries ripen in June. It is odd that one plant has so many common names, but this tree is also well-known as serviceberry. In five days, since I was last here, the changes in leaf-out are noticeable. Most striking are the sugar maples, just last week still in bud, now sporting new leaves. A green-backed heron was perched in the trees at the pond edge; maybe it will nest there, as it did a few years ago. Bella startled a frog. The bluebird was singing nearby; I am sure it is nesting in one of the cavity trees. I am looking forward to the early morning walk to see what else has emerged in less than a week. Time to relax after a weekend of weeding perennials, prepping vegetable gardens, and spreading 3+ yards of compost. It was way too hot -- 90 degrees on Saturday and 80 degrees today - and the black flies were swarming. Despite the weather we dug, hoed, and pushed the wheelbarrow around, with one eye and ear to the trees and sky. Saturday morning a red-shouldered hawk soared over the wetland behind our house, calling loud and clear, keeyuur keeyuur, keeyuur. A solitary vireo (now known as a blue-headed vireo -- I still don't like that name), called slowly and sweetly from the woods across the road, here I am, in the tree, see you.... A red-tailed hawk soared silently over the wetland. In the afternoon a broad-winged hawk's high, thin whistle caught our attention as it flew overhead and landed in a neighbor's tree. Today, a turkey vulture rode the thermals. Our reward at the end of today was to look out at the yard and see all the beds ready for seeding and new growth. Time to plant the sugar snap peas, arugula, and cilantro. To top it off, we found a tiny, quarter-sized painted turtle hatchling crossing the yard. Perhaps disturbed from its nest in one of our garden beds, where it spent the winter, and ready (we hope) to find the wetland. I placed him back enroute, but a little closer, to the wetland. I am back home in New Hampshire for a few days, before going back to Winterberry Farm next week to continue to help with Mom's hip surgery rehab. She is doing great, including a few strolls around the kitchen without the walker and getting back to a few chores such as dishes (even those can be a joy after being chair and bed bound for 3 weeks). Our New Hampshire neighborhood is a week or two behind western Massachusetts in terms of tree and shrub budding and flowering. Here, the red maples are just coming into full red flowers. The lilacs are well behind. A few sights and sounds are the same. The yellowish pine warbler is singing its short, somewhat slurry trill from the tops of pines where it should be. Chipping sparrows are trilling -- a trill longer, and more monotonous than the pine warbler, although they can be confusing -- from trees and wires along the road, content to hang out along the sandy roadsides. Bella and I returned to one of our favorite haunts in Durham, a beautiful trail loop that leads down and along the Lamprey River. It was mid-day and relatively quiet. We disturbed a red squirrel from its perch, forcing it to drop its treasure before devouring the seeds. Bella searched for painted turtles that just slipped into the river. brightens an otherwise still brown trail side. of shiny, dark green leaves and brilliant red berries. A day of drizzle followed by heavier April showers, ushered in fresh green growth and new arrivals. The first ferns pushed up through the forest duff, seemingly overnight. Their fronds still coiled in the bud. By all accounts the cinnamon and interrupted ferns, with fuzzy fiddleheads, are not edible, while the lady fern, with only a few papery brown scales is one of those fine woodland foods. We do not have an overabundance of the latter, so I have not collected them for a saute; instead I leave them to unfurl and go about their seasonal growth. The spring migrants are arriving too. The sweet palm warbler with its rufous cap and bright yellow body below, bobbing its tail as it hops about the red maple. The yellow-rumped warbler, with a patch of yellow on its head and yellow near its wings, and of course on its rump, its loose trill trailing off. Ken reminded me of the yellows in our spring migrants - I saw them today! over time sediment and vegetation crept back in. grown on some of our fields by Brookfield Farm. The pond is a gathering place for all wildlife. others linger through the breeding season or remain year-round. slithering silently into the water as we approach. silencing the pond of croaks that season. Graceful tree swallows skim the surface for insects. Grackles nest in the gray birches. in the snags at the pond edge. Ducks come in ones and twos. A lone male hooded merganser spends a few days. The mallard and wood duck pairs linger a bit longer. filling up on insects before continuing on. while foraging in the underbrush. We visit rain or shine. I have walked this one farm path a half dozen times during the past two weeks, and only yesterday did I notice the willow. It stands at about 10 feet, above my line of sight, and its smooth, rather dull, gray bark does not attract attention. My mind may have been elsewhere, too, thinking about the rabbits that usually live in the thickets along that path, but which I had not seen this spring, or pondering all my work yet to be done. I am not sure what first caught my eye. yellow fireworks beneath a bright mid-day sun. For the rest of the day I saw yellows everywhere. dozens of spicebush in full yellow glory. The daffodils splendid at the back door. Mom's yellow primrose decorates the west perennial bed. Around this time of year, after the snow melts from lawns and pastures, mounds and ridges of dirt appear at the surface, looking like freshly tilled soil. This is the work of a mole. In parts of New England, it could be one of three species. Hairy-tailed mole (Parascalops breweri) has a hairy tail! All three moles are similar in size - bigger than a mouse and smaller than a chipmunk. They are the body builders of the subterranean world, with enlarged, powerful shoulder muscles, no neck, large spade-like front feet turned outward for digging. 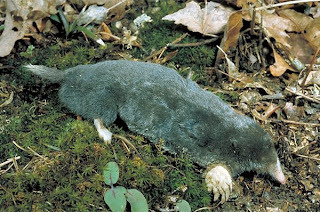 Moles have thick, velvety fur, short, spindle-shaped tails, tiny, mostly hidden eyes, and no external ear flaps. All are adaptations for living underground. Moles are also good swimmers. Burrowing occupies most of their time. Moles tunnel using something akin to the breaststroke, bringing their front feet together in front of the nose and thrusting sideways, pushing their nose forward in the space created. They can also use their front legs like a bulldozer pushing soil around. Moles build several kinds of tunnels. They maintain a deep (up to a foot or more) underground, fortress-like, network of tunnels that is used year-round and connects to the nest. The construction of deep tunnels results in the surface mounds of dirt or mole hills. Shallow tunnels are used in the hunt for food, primarily earthworms and insect larvae, which are found just beneath the surface. These tunnels result in the ridges of soil seen above ground. Mounds and ridges of soil created by moles can easily be raked around during spring yard work. It is a good sign that moles are actively aerating the yard in search of insect grubs. Trying to rid the lawn of grubs to control moles is not effective since moles will switch to earthworms or some other insect prey. The best way to reduce "damage" from moles, is to reduce watering of the lawn. Over-watering brings earthworms and insects closer to the surface, and the moles follow. Converting more lawn to gardens, paths, and natural habitat will also solve some of the problem. And don't make a mountain out of a mole hill. The hillside seeps are now dotted with skunk cabbages, their large heart-shaped cabbage-like leaves smell skunky when crushed. The skunk cabbage (Symplocarpus foetidus), a member of the Arum family, has a flower cluster called a spadix that is tucked inside a green-mottled or dark purple hood known as a spathe. Another plant shares the seep with the skunk cabbage. False hellebore (Veratrum viride) may at first glance be mistaken as another skunk cabbage. A closer look reveals a light green plant, with strongly ribbed leaves, evident even as it first emerges. False hellebore is in the lily family, is odorless, and is highly toxic to livestock and humans. The large leaves clasp the stem. The greenish-yellow flower cluster emerges on a tall stalk above the leaves. 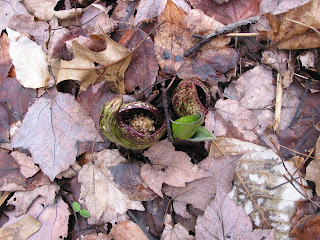 In the photo below see if you can distinguish the skunk cabbage from the false hellebore. We grow some serious poison ivy here on Winterberry Farm. Not purposefully of course, but it seems to favor the soils, air, and moisture on our land. Some of the plants are the orangutans of the vine world. The orangutan, though, is a much more gentle forest creature compared to poison ivy. The leaves, stems, fruits, flowers, wood, and those copious red root hairs all can cause a nasty, itchy rash, red bumps, and blisters. Some people say they get a rash just by looking at the plant. But, only direct contact with the plant can cause the irritation, when the oil is absorbed into the skin. Poison ivy (Toxicodendron radicans), along with poison sumac and poison oak, contains urushiol oil, a sticky, resinous substance that remains active even on dead plants or even becomes airborne from lawnmowing, trimming, or burning. Now I always say that I rarely get poison ivy. I work in and around it a lot (clearing brush -- really). When I come inside after such a day, I wash well with warm water and soap. This has worked well for me. On a rare occasion I will break out in a small rash, for that I use calamine lotion. Still, I wouldn't go hug a tree with one of those thick vines. I like the saying "hairy vine, no friend of mine." Some recent research indicates that poison ivy does better under increased CO2 levels. Just great. I am not in favor of torture, but I could envision some pleasure seeing climate change skeptics spend time barefoot in a patch of glistening poison ivy. For the rest of us, remember -- "leaves of three, let them be." 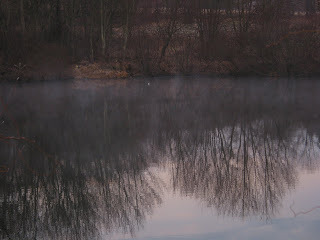 Each day Bella and I walk in the back forty along the field edges, to Winterberry Pond, and back through the woods. Bella searches out her treasures -- special smells, an old piece of bone, dried somethings -- while I find my treasures in the emerging buds of our woodland shrubs and trees. The pace of new bud emergence is quickening as the days grow longer and warmer. The magic in each bud unfolds before my eyes, a set of leaves or flowers pushing out like a newborn bird breaking free of its egg. When you have lived in a house since 1957, you are anxious to get home, especially after spending the last two weeks in a hospital and a rehab center. Welcome home Mom! Mom said today though that when they first moved here she wasn't too keen on the place; it was "a port in a storm." Not many options at the time and the old salt box was a bit run down. Since then, our house -- this house where I was raised and spent 18 years before going to college -- has been worked on bit by bit. Some time during elementary school days I had to help scrape salvaged bricks with a wire brush that were used in restoring the fireplaces. I don't recall that as a particularly fun after school activity, though the results were nice. There was a flourish in the last five years restoring the shed and garage and barn. Dad found a wonderful local carpenter, who he worked side by side with day after day. The house still has uneven floors with wide pine boards, steep stairs to the second floor, and a few other features that remind you of its 1762 vintage. For us kids, these features seem a little daunting for our Mom who will continue rehab at home after hip surgery. But our parents know the place by feel. They can make their way in the dark from the second floor bedroom, down the stairs, to the bathroom, and back again. Talk about a sense of place. For a while Mom will stay on the first floor, while she strengthens legs and arms. No doubt she will mount those steep steps again one day.